When I was a kid Chinese food was the one exotic eating option in rural Australia. For my eighth birthday dinner, I chose the standard family celebration dinner, roast chicken with pavlova for dessert. My best friend came for dinner and brought an exotic offering, a container of fried rice, from the Chinese restaurant that had just opened on the highway. My friend’s dad was a doctor and her family was much more up to date on the take away and eating out options in town. At the age of eight, I could almost count on one hand my take away food memories. For a family of six kids, fish and chips was the most economical option and apart from one heady beach holiday when we ate Kentucky fried chicken ( which become mythically delicious in our memory) fish and chips was pretty much ‘it’, for the family take away. We must have barely had more than a spoonful of fried rice each but it was freakishly delicious to my eight-year-old self and Chinese food became lodestar for decadent take away deliciousness from then on. In those far off days Australian Chinese food was pretty much always a bastardised version of Cantonese food and I still remember when the posh new Chinese restaurant ‘The Dragon Court’ opened, to much excitement and fanfare, in our town. It was a rare occasion when my parents took us to a restaurant and so our family did most of our culinary exploration through cooking at home. Our town had a couple of Chinese grocery shops that stocked a reasonable range of Asian ingredients and when I was a teenager I painstakingly worked my way through the Australian Women’s Weekly, Chinese Cooking Class Cookbook which is still the pinnacle for retro seventies Australian Chinese food – soo good!! We’re all more sophisticated now and Chinese food is no longer defined just by Cantonese cooking, but I have a nostalgic, sentimental fondness for good Cantonese food. I particularly love the braises with their cornflour thickened sauces. 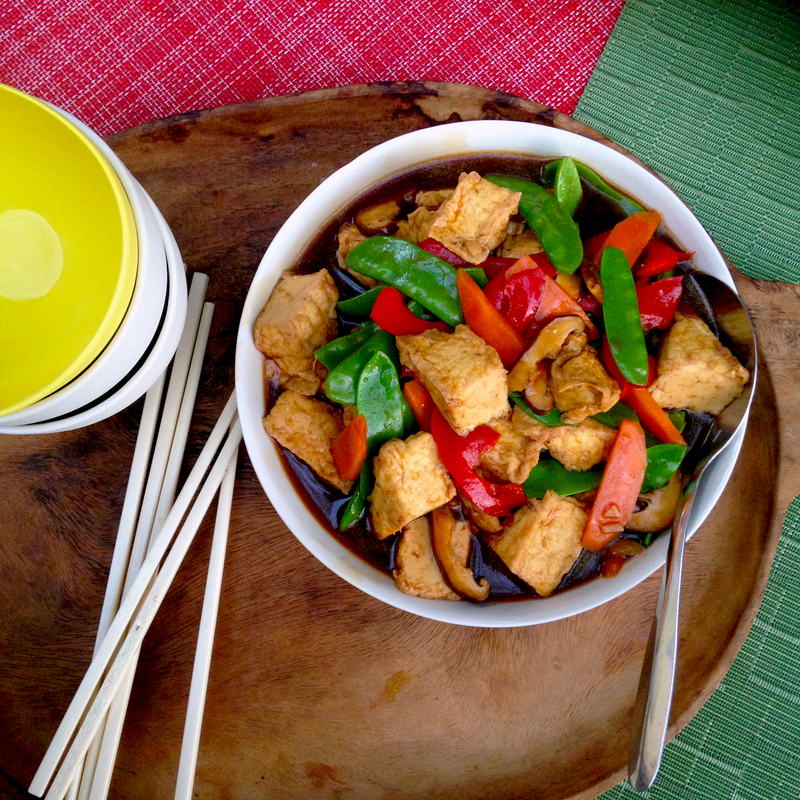 This braised Cantonese style tofu, as well as being nostalgically comforting, has enough protein and veggies to make a complete, quick and easy one wok and rice pot meal. The oyster sauce is optional, but there are vegetarian oyster sauces with a mushroom base which make a good alternative. There is also a pretty convincing vegetarian/vegan case for eating oysters here Oysters have no central nervous system and if farmed properly are not only environmentally sustainable, can actually be beneficial to water quality. 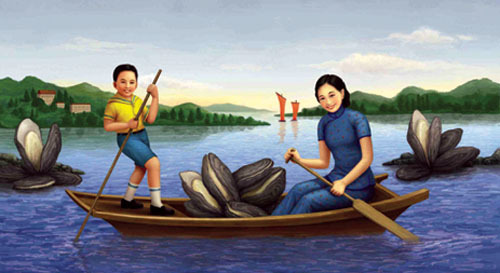 If you do eat oysters, Lee Kum Lee premium oyster sauce has 40% oyster extracts (so it really is ‘premium’ and superior to other oyster sauces) It also has the classic, fabulously beautiful label of the lady and boy on a boat collecting giant oysters, which has to be one of the best food labels of all time. Mix together cornstarch and one tablespoon of water in a small bowl and set aside. Make stock mixture – Add oyster sauce, sesame oil, soy sauces, Shaoxing wine, sugar, salt and stock in a bowl. Heat 1 tablespoon oil in a stir fry pan or wok. Pan fry tofu on both sides until golden brown. (you may need to do this in batches) Set tofu aside. Heat another tablespoon of oil to wok and heat. Add minced garlic, ginger let sizzle for a few seconds and add mushrooms, carrot and red pepper and stir fry for a few minutes. Then add tofu and stir fry together until mixed before adding stock let it simmer for a minute before adding snowpeas. Then add cornstarch mixture gradually until sauce thickens and vegetables are just tender. If sauce is too thick add more water. If sauce is too thin add more cornstarch mix. *The tofu factory I buy my fresh tofu from, also does beautiful fried tofu triangles, which I use in this dish and skip the pan frying step. *If I’m using water instead of stock I generally add a bit extra oyster sauce, soy sauces and aromatics (garlic, ginger, spring onions) Two good vegetarian stocks for Asian dishes are a this one here from Kylie Kwong’s Simple Chinese Food as well as this black bean stock from Fuschia Dunlop’s Revolutionary Chinese Cookbook.